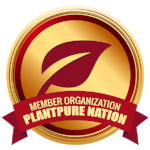 We offer support & encouragement to pursue a plant-based lifestyle. Research shows that a whole-food, plant-based diet is the most effective way to achieve and maintain optimal health. Eating a whole food, plant-based (WFPB) diet can reduce your risk for a wide range of chronic diseases, and sometimes even halt or reverse many of these, including type 2 diabetes and heart disease. We know that changing how you eat can be a process, and we recognize that big changes can seem daunting. However, we also know that adopting a whole-food, plant-based lifestyle is incredibly rewarding – we’ve seen it over and over again, right here in our community! We know this way of eating can dramatically change your life for the better, and we can’t wait to introduce you to this lifestyle. Find out about our organization, mission, programs, and the results of our advocacy.